Can You Crack the Code and Get Some Big Wins? 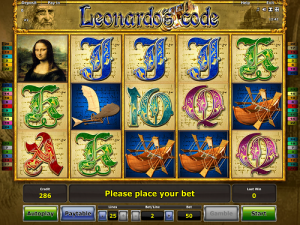 This slot is all about the genius that is Leonardo da Vinci! He was born in the middle of the 15th century yet he is still one of the most famous men on the planet. His really is a household name. Da Vinci is known for his incredible intelligence, curiosity and his contributions to the fields of: art, sculpture, science, mathematics, engineering, astronomy, music, and many more. His most famous works include: the Mona Lisa, the Vitruvian Man and his self-portrait – all of which can be found on the reels of Leonardo’s Code. This is a new slot game, made by the geniuses over at Novomatic! While they might not hold a candle to Leonardo, they certainly know how to make a great slot game. This one in particular has 25 paylines, 5 reels, 3 rows and an RTP (payout percentage) of exactly 95%. In Leonardo’s Code, you can get some big wins and you can win Free Games. Although the theme is unique, it’s a very standard Novomatic video slot. Wild symbols are present on the reels, as are card symbols, Scatter symbols and themed picture symbols. Being a video slot, you’ll love to see them symbols move when they form a win! Typical Novomatic slot music and slot sound effects form the soundtrack to this game. The autoplay feature and the gamble feature are both typical of Novomatic. As usual, all of the settings and the bets can be altered at the bottom of the reel (except for the sounds, which you can mute/unmute at the top right-hand corner). Try out Leonardo’s Code here for free at NovomaticCasino.co.uk before you play at one of our recommended Novomatic Casinos for real money. You can play all of Novomatic’s video slots here for fun, including their most popular slots: Book of Ra Deluxe, Lucky Lady’s Charm Deluxe , Haul of Hades and Apollo God of the Sun. As is pretty common for a Novomatic slot game, the lowest-paying symbols on the reels are high card values. In this game in particular, the card values on the reels are: 10, Jack, Queen, King and Ace. These are so elaborate and fancy, designed in 15th century calligraphy style, the colours really help you to distinguish between them during the game! The 10 is turquoise, the Jack is blue, the Queen is purple, the King is green and the Ace is red. Leonardo’s two inventions are the next highest-paying symbols, and these are the plane and the boat. The Vitruvian Man pays out more than these symbols and the Mona Lisa awards the biggest wins of all. 3 consecutive matches are required for the card value symbols to pay out and, for the other symbols, 2 consecutive matches are enough. So long as the matches begin from reel 1 (the far-left reel). In Leonardo’s Code, the Wild symbol is the also the Scatter symbol – which means the Scatter symbol is also the Wild symbol! This all-powerful symbol is the Cryptex symbol. It can pay from any position as well as being able to fill in for any of the other symbols in the game – but only if it lands where it will complete a win and get you that win! When you spin 3 Cryptex symbols in one go, the game will award you the win and will also reward you with 10 Free Games! Before the Free Games begin (which are played out on the same reels as the ordinary game), one symbol will be selected. This special symbol will have the ability to expand over an entire reel and award additional wins. Card values will expand when 3 or more land and other symbols will expand when 2 or more land (as relates to how many matches you need for a win).